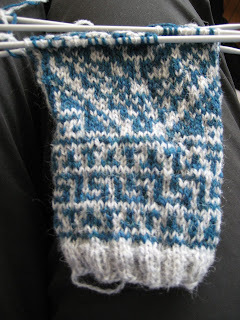 My very first fair-isle. It's a little bumpy, and doesn't have much give but it's mine and I love it! 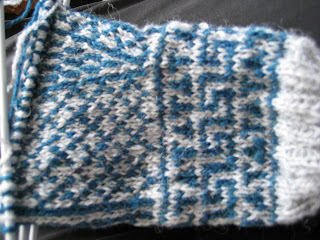 Here's a photo of the first mitt in progress. I've been drooling over Eunny's Venezia pullover from the Winter issue of Interweave Knits since she gave us the first sneak peak on her blog. Seeing as how I still haven't finished a sweater project (details on why to come), have never done stranded colour-work, and start to hyperventilate when a pattern calls for little needles (except socks) it was clear that a warm-up project was in order. 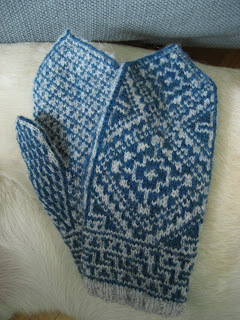 These mitts were perfect since they are small (both in size and in yarn investment), require fair-isle, and use Jamieson's Shetland Spindrift (the same yarn called for in Venezia). 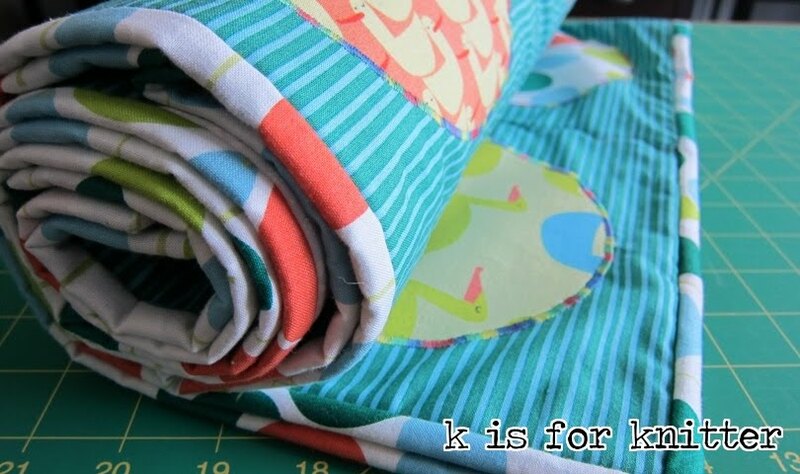 Here is the front just short of the halfway mark. The yarn seemed a little scratchy after being knit up but blocking has turned it into a soft and uniform fabric. I didn't make any modifications to the pattern but next time I knit these I will be sure to make the thumb a few rows longer for a better fit. Posted by Amanda at 8:38 a.m.